Looking for a fun platform jumping game for your iPhone? In the Raccoon Rising app for iPhone and iPad, you play as a Raccoon who loves nothing more than sleep. Ironically, this raccoon that you control has some pretty wacky moves during gameplay. You’re awaken by an owl, who seems to act as your master. It doesn’t take a rocket science to figure out that the goal of Rising Raccoon is to get up higher in the air, using a variety of ninja moves to avoid obstacles in the way. The owl teaches you some basic moves in the first level of Raccoon Rising, but it takes some of your own thinking to progress to the next phase. With each new level, a new environment is brought about. Whether it’s the beginning tower you start in or the Tanuki Forest, each level has a beautiful background environment that seems to be alive, rather than just static background artwork you’d find in other games. Phases divide the levels, so if you die an unfortunate death, you’ll respawn in that specific phase instead of starting from ground level once again. Every now and then you’ll encounter certain enemies, which all seem to have their own way of being defeated. In Tanuki Forest, I met my first foe – a pirate robot riding a bat-like creature. It took some time for me to figure out how to win against this enemy; brute force alone won’t help much. After declaring victory, the story continued to unravel and I was introduced to the next level. The controls are simple enough – tap on a certain area to jump to it. Of course, you don’t have an unlimited range to jump, so you’ll have to time your moves and predict where you’ll land every time you make a move. The audio and graphics are superb, running especially well for an iPhone app on a 3GS. Raccoon Rising features a beautiful art style and the sounds certain actions create don’t fall short. I couldn’t imagine the kind of quality you would see on the iPad running this application. Speaking of iDevices, I’ll take this time to warn users that this game isn’t supported on the iPod Touch. At $0.99, this is a no-brainer. With hundreds of thousands of apps on the market, it’s not easy to find the high quality games like Raccoon Rising. 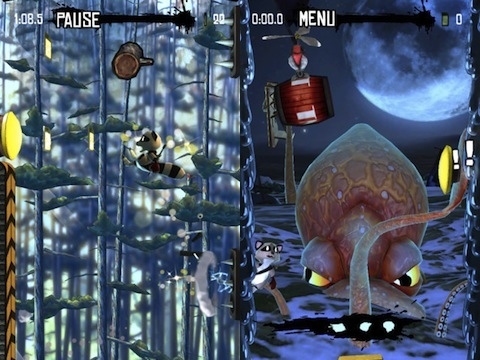 The 60 different phases and high quality graphics will keep gamers playing Raccoon Rising for a while. 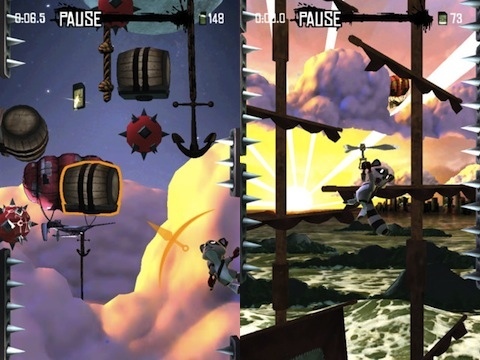 AppSafari review of Raccoon Rising was written by Darius Reimm on November 23rd, 2011 and categorized under Action, App Store, Games, Platformer. Page viewed 5554 times, 1 so far today. Need help on using these apps? Please read the Help Page. It is very nice. My kids loved the raccoon….